Ambrose Hawkins is a name known only to keen clock enthusiasts. His name was not even recorded in Baillie's standard list of makers, 'Watchmakers and Clockmakers of the World', until my revised version came out in 1976 as Volume Two. His clocks are few in number, are jealously guarded by their owners, and rarely come onto the open market. The clock described here is the only one of his I can personally recall seeing for sale for the past thirty or more years, until just recently his celebrated quarter-chime longcase clock came up for auction (no. 1 on the list). He worked for only about seventeen years, not a long working life for a clockmaker. His clocks are extremely rare and include some of amazing quality. Those so far documented are described below. Much of what is known about him was uncovered by Clive Ponsford and published in his book 'Devon Clocks & Clockmakers' in 1985. More information was compiled by A. J. Moore in his more recent book 'The Clockmakers of Somerset, 1650-1900', a book which was published so privately it was out of print before I even knew of its existence with the result that I have never managed to acquire a copy. Ambrose Hawkins was married on 25th July 1688 at the church of Saint Augustine the Less in Bristol, Somerset, to Ann Inman. One source says that he was from Renton in Somerset, but I can find no such place. Though he was married in Bristol, he worked in Wells in Somerset (about twenty miles south of Bristol) where his first known child, Elizabeth, was baptised in St. Cuthbert's church in 1690. Later a daughter, perhaps Elizabeth or perhaps a more recently-born, unbaptised child, was buried at Wells in 1692. Between 1692 and 1695 he moved to Exeter in the neighbouring county of Devon, living in a house behind St. Martin's church. In October 1695 a son named Henry was baptised at Exeter. Henry was followed by Thomas in 1697 (who died in 1706), and by Ambrose junior in 1699. Meantime, on Mayday 1696, Ambrose was granted permission to set up shop in the Cathedral churchyard (St. Peter's) by the Bishop: 'I doe hereby grant and give liberty and priviledge to Ambrose Hawkens to open and keepe shopp in ye churchyard of our cathedral church of St. Peters Exon, wherein to worke and to make clocks, watches and jacks' (i.e. clockwork roasting jacks for turning meat over a fire). Later that year he was employed to repair the cathedral clock. He died in August 1705, his widow about 1711. In 1699 he worked on the church clock at South Molton, Devon, and in 1702 on that of Crediton, Devon. In 1705, the year of his death, he made a turret clock for the church of St. Saviour's in Dartmouth, Devon, signed 'IOHN SPARKE MAIOR OF DARTMo. 1705, AMBROSE HAWKINS DE EXON FECIT'. In the same year he made a very similar turret clock for the church of Modbury, Devon, signed 'Ambrose Hawkins de Exon fecit 1705'. The only Ambrose Hawkins whose birth I can trace about the right time was born in London in 1662 in the parish of St. Giles Cripplegate, the son of Richard and Ellen Hawkins. This may be no more than coincidence, but if this is our man, his London origins, and no doubt London training, would explain his excellence in the craft, as his work is every bit as sophisticated and refined as London work of the day, his style is London styling, and his abilities far beyond those of a country clocksmith. Other aspects suggest he was related to the Savage family of clockmakers of Exeter, who also had London training and connections. The clock trade was much more family-orientated than we might first think. Practitioners took up the trade not through random choice in haphazard locations, but by strict family control, judgement and planning. Apprentices often went to train under uncles or cousins, usually from the age of fourteen to twenty one, but occasionally they began younger. Not only would the family be aware of the relative's abilities and standing in the profession, but a youngster might expect better treatment during his seven-year live-in apprenticeship with a kinsman than he would get from a stranger. As an apprentice a young fourteen-year-old trainee clockmaker could have a hard life. A record exists of an apprentice, Thomas Mitchell of London, who in 1786 raised a complaint against his master 'for not giving him sufficient food, sleeping in the coal hole, not having had clean sheets since last February, repeatedly beating him in a cruel manner and keeping the lad to work from five o'clock in the morning till two or three o'clock next morning'. In about the year 1743, James recalls, he was working one day with his elder brother, William, when they asked their father when their term of apprenticeship would end. He replied it would be when they were twenty one. As they were unsure when that might be, the two secretly went together to check in the church registers for their dates of baptism, the only means then available of verifying their ages, only to find they were already over twenty one. When they mentioned this to their father, he flew into a violent rage, and struck James a blow that knocked him off his workstool. The next day James packed his bags and left home with only five shillings in the world. If that could be an apprentice's life with his own family, how much worse might it be with strangers! So families were usually careful to whom they apprenticed their children. To return to Ambrose Hawkins, he died relatively young, probably only in his forties (forty-three if we have the right year of birth), leaving a widow with young children under the age of ten. He seems to have been working vigorously right until his death - witness at least two turret clocks installed in the very year he died, two we know of any way, and perhaps others we don't know of. Was he suddenly struck down by a fatal illness, or a fatal accident? A fall when installing a church clock? We will never know. There are intriguing reasons, still largely unclear to us, for his move to Exeter. In the 1650s one Benjamin Hawkins had property in the Close there (where Ambrose went to live in the 1690s). Benjamin I had a son, Benjamin II, born in 1653, who became a grocer and had a son, Benjamin III, born in 1684. Benjamin I was a cousin and friend and overseer to the will of Peter Savage of Exeter, who was a clockmaker there from 1623 till his death in 1657. In 1711 Benjamin II, the grocer, was one of the lessees of the house of the late Ambrose and his late widow, one of the executors of Mrs. Hawkins. So Ambrose must have gone to Exeter to join relatives, who already had connections in the clockmaking trade there, namely his Hawkins relatives who were related to the three-generation Savage family of clockmakers. The Savages had worked in Exeter since the sixteenth century, but I think I am right in saying that no domestic clock by any of them is known to survive today. There may have also been stiff competition within the clock trade in Wells, which persuaded Ambrose that he would have better prospects elsewhere. Ambrose Hawkins is the earliest maker in Devon by whom longcase work survives and virtually the only one from the 17th century by whom any work survives at all. He is one of the earliest makers in the entire West Country by whom longcase clocks are known, and these number only eight examples, all of exceptional quality. No other maker from this region made clocks of this complexity and quality, and very few did so anywhere in the whole of England. A normal eight-day clock has two trains (sets of wheels), one for going, one for the striking of the hours. A clock which also chimes quarter hours normally needs a third train for that purpose. Two of the known clocks by Ambrose Hawkins are three-train clocks. A quarter-chime clock strikes each quarter hour on however many bells are provided for the purpose, in Hawkins's case six bells, and would therefore ring a peal of six at quarter past each hour, two peals of the same six at half past, three peals at quarter to, and then strike the hour as normal on a single (different) bell. Some will also chime four quarters on the hour, followed by the hour strike. The quarter-chime bells are attached as a 'nest' of bells, each one cupped inside the next larger one. The hour is struck on a separate single bell, so that a 'six bell quarter-chime clock' will in fact have seven bells, i.e. six plus one. One of his finest clocks, of several truly exceptional ones, is the month duration six-bell quarter chiming example - item no. 1 in the list below. This is in an exceptional case described some years ago as in 'mulberry', now described as being in 'stained field maple' - used as a veneer of course onto an oak carcase. I am told that 'mulberry' does not refer to the wood of the mulberry bush, but is the term given to one of several rich burr woods, such as maple, which has been cleaned down with aqua fortis (nitric acid), and the grain then filled with lamp black to produce a golden yellow colour with pronounced contrasting burrs. A grand sonnerie longcase clock is also known by him. This is a clock which strikes each quarter hour, after which it also strikes the number of the past hour. It therefore counts the number of the hour on four separate occasions in every hour, after each quarter-hour has chimed. This is especially useful in telling the time during hours of darkness. Because of all the extra striking of the hours in such a clock, the movement has to store enough striking power at one winding to be able to strike the number of blows in a week that a normal hourly-striking clock would have to perform in twenty-eight days! This is a particularly complex kind of clock, of which few examples are known and those mostly by the very best London makers, those by provincial makers being almost unknown. Those which are of month duration are virtually unknown by anybody. This strike system was very rare and was usually limited to bracket clocks, longcase examples being very few. I have only ever handled one grande sonnerie longcase clock. For Ambrose Hawkins to have made a grande sonnerie clock at all is quite remarkable, but to have made one of month duration is probably unique amongst provincial clockmakers. 1. The Ambrose Hawkins eight-day clock (item 3 listed above) in its case of Brazilian rosewood after restoration. The door is burr elm, the rest of the case veneered in rosewood. To dismantle a clock (for repair or servicing) it was necessary to take apart the clock plates to release the wheels. With a two-train clock this was relatively straightforward. With a three-train clock however this was a tricky job, but to make it less difficult some of the very best makers in the land would split the front plate into three sections, so that each section was individually capable of being dismantled, leaving the other two trains assembled - a much easier task. Ambrose Hawkins built split trains on his three-train clocks, even though this meant a great deal more work in the clock's making. Split trains are a sign of exceptional quality in workmanship, rare anywhere but exceptionally rare in provincial work. The movement plates of a normal eight-day two-train clock are held together by at least four corner pillars, though in London and the South five pillars were normally used. Some very early London clockmakers might exceptionally provide their clocks with six pillars - in theory for greater strength and rigidity but not really necessary and largely done just for show. A three-train clock with a split frontplate would need more pillars, simply because each of the three dismantleable sections has to be capable of being held together in isolation of the other two. Even so the provision by Ambrose Hawkins on his two three-train clocks, of one with ten pillars and the other with eleven is quite extraordinary and a further sign of excellent workmanship. This present clock, number 3 in the list and pictured here, is by comparison a modest eight-day example with five pillars - generous enough but not extravagant! It has an interesting history. It last changed hands in 1953, when the last owner bought it from an antiques dealer in Puddletown, Dorset, at a cost of £18.00. Until recently the clock movement had not been cleaned since then (over half a century ago), but still was still in full working order - another testimony to Hawkins's fine workmanship. The base of this clock case had been replaced long ago, probably in early Victorian times, something we have come to regard as normal with clocks over three hundred years old. As almost always happens, the colour of the replaced section had 'drifted' away from the colour of the rest. Even though the replacement may have been matched perfectly to the rest when it was made, time had made the two sections fade at a different rate from each other. It was clear that the polish needed a surface clean, and, if need be, the replaced base could be coloured back again to match the rest. The replaced base was clearly in Brazilian rosewood, a rare and costly wood at all periods and used almost exclusively as a veneer. It is traditionally said to be named after the fact that it smells like roses when being sawn or planed. I am now informed by those who know such things that this is incorrect and that it is named from the colour of the wood when cut, not the smell. The remainder of the case appeared to be made with walnut veneer, with the exception of the very fine door, which was in a burr veneer - it proved to be burr elm in fact. Burr woods are exceptionally hard to recognise as the fancy 'burring' obscures the wood's normal grain. Burr and pollard woods are very similar - the burr being a fancy figuring produced in the distorted root system or through a natural disease, and pollarding produced artificially by frequent prunings around the tree stem. Rosewood was especially popular and readily available (at considerable cost) in early Victorian times, typically in the 1840s, and it could well be that the base was replaced at that time. It was assumed that the replacement base had been made in rosewood in error because the main body of the walnut case had been wrongly identified at that time as rosewood. It is a well-known fact that rosewood fades with exposure to sun and light, and faded rosewood can look like walnut. In actual fact when a few repairs were undertaken to the main body of the case, and the perished polish removed, it was discovered to everyone's surprise that the veneer of the main case was actually rosewood. So the replacement base had been made in the correct wood after all. The fact that the whole case was veneered in rosewood came as a considerable surprise. Rosewood is a complicated wood to understand - I certainly did not understand the history of its use in Britain and am indebted for the following information to Dr. Adam Bowett, an eminent researcher into the identification and use of furniture woods. His article 'Myths of English Furniture History: Rosewood', published in February 1999 in Antique Collecting magazine, was an eye-opener. Not the least problem was that the name 'rosewood' was used at different times in history to refer to different woods, which makes historical mentions of 'rosewood' confusing to say the least, as many do not refer to what we today known as rosewood. However this particular clock case appeared to be veneered in the wood we do know today as rosewood, which in fact is Brazilian rosewood (Dalbergia nigra), and was subsequently positively identified microscopically as being so by Adam Bowett. Adam Bowett's article summarises how Brazilian rosewood came to be used in Britain. Brazil was a Portuguese possession, from which this wood had long been exported. Rosewood was used in making furniture in Portugal and Spain in the seventeenth and early eighteenth centuries (at that time it was called palisander), but not in Britain, because we were at war with Spain. In 1808 Napoleon invaded Spain and Portugal, which latter country immediately signed a peace treaty with Britain. Britain was therefore for the first time allowed to trade with Brazil, and from 1809 the first cargoes of rosewood were shipped into Britain. Within a few years the wood became very popular and British furniture veneered in Brazilian rosewood is often typically found in the 1830s to 1860s. It was almost always used in veneered form, probably because of the sheer cost. Rosewood is one of the heaviest and most dense of all furniture woods, weighing fifty three pounds per cubic foot - against which oak weighs a mere forty six and the densest mahogany forty eight. A wood as dense as this is immune to such pests as woodworm, which choose to cut their teeth on softer woods. Those few timbers, which are more dense than this (there are a few such as ebony) tend to sink in water! Rosewood came gradually into its greatest period of popularity and by the 1830s and 1840s was widely used, both in veneer form for cabinetwork and in the solid for such items as chairs and table legs. So popular, and so expensive, was rosewood that many of the cabinetmakers' instruction manuals of the gave directions of how to stain beech, a very cheap and readily available wood, to look just like rosewood. This treatment is today known as 'simulated rosewood'. At the time Ambrose Hawkins's clock case was made, rosewood was not just rare in England, it was virtually unknown. So how did this British clock case come to be veneered in Brazilian rosewood in the late 1690s? The likeliest explanation is that this timber was plunder, looted from a captured Spanish or Portuguese ship, brought into a south-coast English port and auctioned off there, as was regular practice with any prize booty. The rarity of this wood at that time is a further measure of the value placed on this clock when first made. A 'masterpiece', being a month duration, twelve-inch dial, six bell quarter-chime longcase clock with unique, skeletonised, twelve-inch dial engraved with sporting scenes between hours, herringbone border, signed 'Ambrose Hawkins de Exon fecit'. It has eleven pillars, three trains, split frontplates in three sections. The case was formerly said to be in mulberry wood, but is now described as 'stained field maple'. 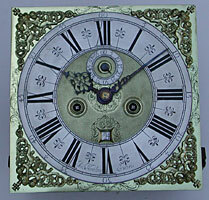 This clock was sold in July 2005 at Christie's, London for £36,000. An exceptionally rare month duration grande sonnerie clock c.1700, eleven-inch dial signed 'Ambrose Hawkins de EXON fecit', twin cherubs with crowns spandrels, herringbone border, in a walnut case, described and illustrated in Tom Robinson's book 'The Longcase Clock'. Split frontplate in three sections, ten pillars, rack striking outside the backplate. Eight-day longcase with eleven-inch dial, twin cherubs with crowns spandrels, five pillars, outside countwheel striking, signed 'Amb Hawkins Exon', the case originally believed to be walnut is now identified as rosewood, no hood pillars. ( This present clock). Marquetry longcase said to be by 'Ann Hawkins Exon', eleven-inch dial with cherub & crown spandrels, outside countwheel, calendar, sold Sothebys Dec 1968. This is almost certainly a mis-reading of 'Amb. Hawkins', although his wife was called Ann. It is conceivable that she continued the business briefly after his death with the help of a journeyman. But outside countwheel striking was old-fashioned by 1705, by which time the countwheel was positioned inside the movement. Eight-day marquetry - no details known. Maybe the same clock in 4, double-counted. A month duration walnut longcase - no details. Thirty-hour single-handed longcase - no details known..
A single-handed thirty-hour wall clock - no details known. Lantern clock 'Ambrose Hawkins de Wells ffecit' recorded in 1923. Britten lists lantern clock 'c.1650' Ambrose Hawkins de Wells Fecit'. Perhaps the same clock listed in 10.